Marceline the Vampire Queen was a lot of fun in her first appearances on Adventure Time, but nobody could have predicted how much she’s evolved, and how much of a fascinating, key part of the series she’s become. We talked to Olivia Olson, who voices Marceline, about Marcy’s relationships... and her future. Spoilers ahead, if you’re not caught up on Adventure Time! Marceline just starred in her very own miniseries, Stakes, which comes out on DVD next week. So we were lucky enough to speak to Olson on the phone about Marceline and her journey. At first, when Olson saw that Marceline was being cured of vampirism, she thought they were getting ready to kill her off. She only got the scripts for that miniseries a week at a time, as they were recording, so she was in major suspense about how Marceline would escape being tied to a windmill and exposed to sunlight, and all the other dangers she’s put into. Because the episodes were shown on consecutive days the fans actually got to know how the story turned out more quickly than Olson did. Marceline “has changed so much,” says Olson. “She’s progressed a lot as a character.” Back in season one, “she was more of this prankster,” and was set up as a “funny antagonist character towards Finn and Jake.” Over time, she’s turned into their close friend, and we’ve learned more about her tragic backstory that helps to explain why she was so mean when we first met her. 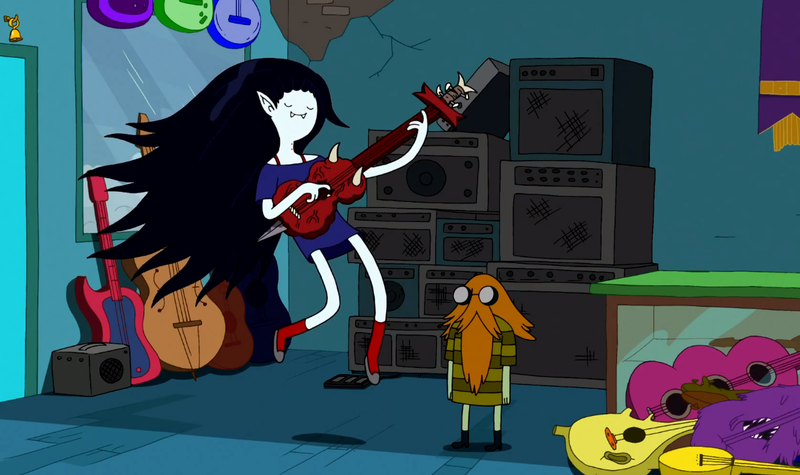 Back in season one, too, Marceline seemed like she was just a teenager. “I think she was sort of stuck in those sort of ways, because physically, she hasn’t changed,” says Olson. “I think she was just hiding a lot of her emotional pain, and just trying to be sort of the fun prankster friend.” But after the events of “Stakes,” she’s matured a lot, and we’ll see her in a new light, says Olson. Meanwhile, Olson says Marceline is always holding onto hope that she can get her friend Simon Petrikov back from the curse that turned him into the Ice King. She saw a glimmer of hope in the episode “Betty,” where Simon is briefly back and knows who she is. “I think she saw him slipping away into this crazy new different person, who doesn’t really know her,” says Olson. “I think she’s aware that it’s a long shot. She doesn’t want to get her hopes up about it. There’s always going to be that hope there,” and Marceline will always be “wanting him to just snap out of it.” She has no idea what will happen with Marcy and Simon, but she doesn’t think anything will happen quickly. Still, Marceline will be there if and when Simon needs her. In fact, her relationships with both Simon and her father are kind of similar, says Olson. “It’s pointless to try and change her dad, and have this good father-daughter relationship.” Olson can’t help wondering where Hunson was when Marcy was stuck in a post-apocalyptic hellscape with Simon, and then hunting vampires on her own. That’s one of the things that Olson likes about Adventure Time: “They have these storylines where not everything works out for everyone. When Finn meets his dad, he’s building him up, he expects him to be a hero like Finn, and that’s so not the case.” Marceline will always love her father, because “they’re family,” but “there’s family that’s not great to be around, because it’s a toxic relationship. I think it’s a good thing that Adventure Time puts these kinds of relationships out there, because life doesn’t always work in this cookie-cutter way.” This series shows people that you can have messed-up family relationships and “still be a strong person and come out on top,” adds Olson. That’s an especially great message to see on children’s television. “It’s a really fun storyline,” says Olson, but she’s not sure if romance is “the direction the show is going to go in.” There’s definitely something going on with Marceline and PB, but it could be either a relationship or just a friendship ending in a weird fashion.